Jill and I were with Bill Deering on a Visual Communications study abroad with about 2 dozen students. We were about 3 days short of leaving to come back to the U.S. after a 5-week visit to London. A group of terrorists bombed the London Tube system along with a bus. The main Delaware newspaper ran a top of page 1 article on us being in London at the time. It was kind of a strange article as it looked like Bill and I were the suicide bombers. It was also strange that in the original photo we are side-by-side, but they cut us apart. This is a Google Maps aerial photo of the area. The deck outside our flat is the arrow in the upper right. The bombing was at the bus stop with the lower left arrow. 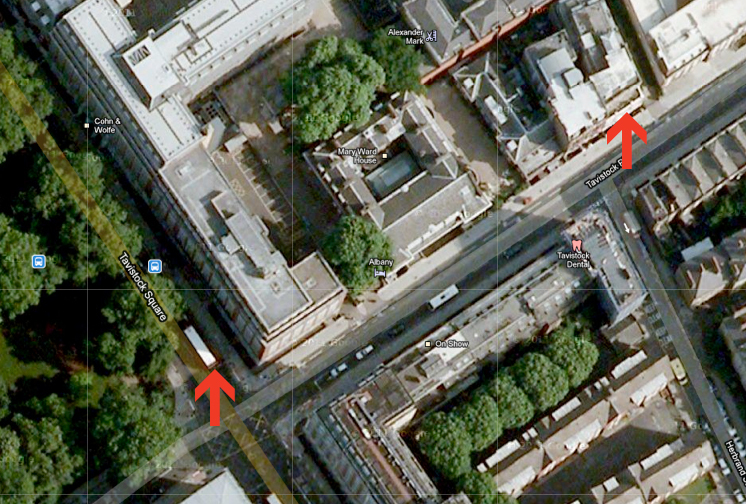 One of the bombings in the tube was only about 6 blocks from our flat. We had a group of 4 students who were coming over to our apartment for a bookbinding workshop. They were in the elevator when the bus bomb went off. We couldn't tell what had happened, so I walked out to the balcony to look down the street to see if I could see anything. You could tell it was near the corner of the block. In the photo above Jill’s and my flat is at upper right corner. It is about 150 yards to the bus stop involved in the bombing which killed 13 riders. I walked directly to the corner, stopped for a moment, and was then encouraged to step back by the police. I believe I was the first person they moved back. The store I was going to is directly down the street the bus was on. I needed to run down to Faulkiner’s to buy a few supplies for the workshop and walked right to the corner at the bombing. I would have gotten there within 3 or 4 minutes. Probably one of only 5 times I was on the streets of London without my camera during the trip or I might have had the photograph that went around the world. The New York Times called us about 2 hours after the bombing to see if we had any photos. A former student of Ray’s was a photo editor at the NYT and knew we were in London. I walked up to the base of that red pole. This photo is taken from the 3rd or 4th story of the building across the street. While I was standing on the corner maybe 75 feet from the bus the police swarmed the area, I was the absolute first person they told to back up. This is what the street looked like when I got back from Faulkners. You can see the street crossing in the upper right corner where the bus was. I walked the 15 minutes to Faulkiner's and bought my supplies and started back to the flat. About halfway to the flat it was clear I wasn't going to walk anywhere near the bombing. I stopped at a couple of restaurants and stores that had TVs going to catch new information. Within a few minutes of the bus bombing there had been a bombing on the Russell Square Tube line which was the train we used most of the time when leaving our flat which was only 2 blocks from Russell Square. It took me the better part of 90 minutes to get back to the flat and even then took a Proclamation of Parlement to get the police to let me back into my block. After spending the day watching TV and making books, we decided we would walk the students the 2.5 miles back to their flats. All of the buses and tube lines were shut down. There had been 3 near-simultaneous bombings on the underground, one of them between the Russell Square station and King's Cross. As it turns out, we were in the thick of it. The 4 students and their final pieces at the end of the bookmaking workshop. We walked past a point which was about 2 blocks looking at the back of the bus (would be to the upper left of the aerial photo). Television was going crazy with the speculation. Jill and I didn't want to do anything to bring any more negative feelings into the events as it had been a fabulous trip. We walked lazily back. We happened to pass an Arab bakery on the way and thought it might be a nice moment to ignore the anti-Arab hysteria that was slowly taking over London. The students were in complete agreement which felt quite nice. But honestly, at the time we didn't know anything about who the terrorists were. We bought a great chocolate cake (shown before and after above) to take back to the student flats to share while we made sure everyone was ok. The signs at the Tube Station nearest where the students were staying. After an hour or so, Jill and I started our walk back to our flat. The students were in good spirits, but the lack of public transportation was going to slow down our final few days. Fortunately, we didn't have any specific events scheduled except a final night dinner. I had scheduled to visit William Caslon's gravesite with David Huynh to do a rubbing. David met us at our flat, and we walked up to King's Cross. Even though the gravesite was easily walkable, we caught a bus just to see how that felt. As we walked to the bus Anderson Cooper was doing a newscast for CNN. Jill and David at Caslon's gravesite. The streets were empty and there were no police anywhere around us, so we jumped the iron fencing to do a rubbing. All in all in interested, though morbid, day.